Redrock make mattresses for Domestic use and leisure and commercial vehicles. Redrock products are made in Lancashire, UK. They make products for use at home and in leisure vehicles, be it a caravan, motorhome, boat, campervan, even trucks. Measure your sleeping space for a custom sized mattress specifically tailored to your needs. Head on over to their website and fill in the measurements, it’s that easy. Their motto is ‘ If you can measure it and draw it, then they can make it.’ Domestic mattresses come in standard sizes whilst leisure mattresses are lightweight and designed specifically for vehicles. They also sell mattress toppers and pillows for use both at home and in your leisure vehicle. We have a 5cm deep king size mattress topper and couldn’t decide which of their pillows would be best suited to us so thought we’d try both, and argue later over who got what. Whilst the pillows appear very different in size, when placed together on a bed the size is hardly noticeable. 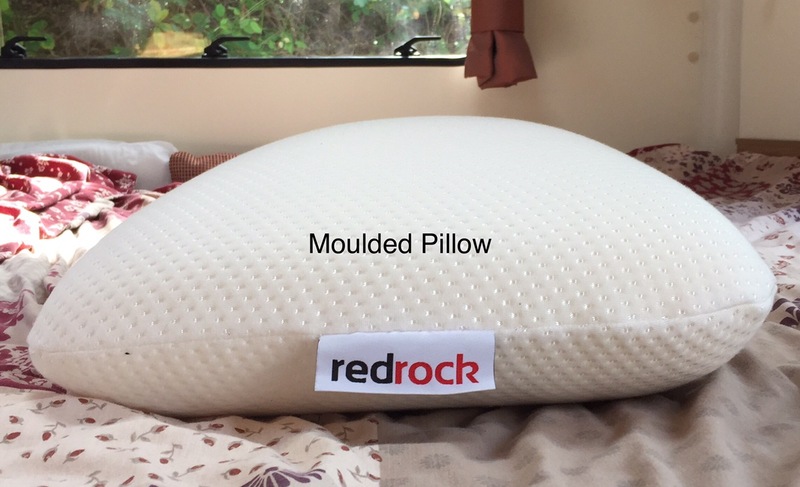 The Redrock Moulded Pillow is designed to give full support to your head, neck and back whilst sleeping. It’s made up of a high density memory foam which springs back quickly during use. It comes covered in a lovely, stretchy, removable, washable protection cover. For people who like a very flat sleeping experience this pillow may not be for you. I, ordinarily, use two pillows and this pillow was plump enough to look good on the bed whilst providing the height of pillow I am used to. They are very firm and support rather than allowing you to sink completely into the pillow, whilst maintaining a very comfortable soft head and face contact. The Boss likes to sleep on his side and said this pillow was perfect for him. I found it too firm for me, I like something softer. 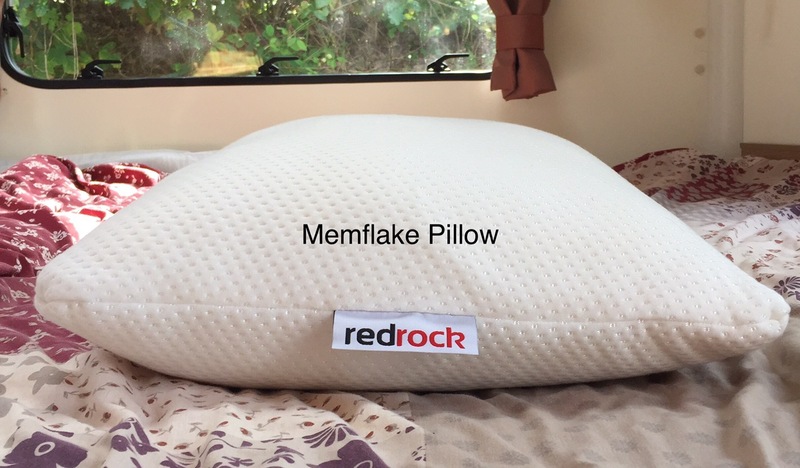 The Redrock Memflake Pillow feels more like a standard pillow, but firmer and retains its plumpness after continued use. This being the bigger of the two pillows in the image above. Using high quality memory foam flakes this pillow gives a firm but softer sleeping experience whilst still supporting your head, neck and back. Again, very plump, removing the need for anyone who likes two pillows. This pillow is more malleable than the moulded pillow. Whilst having a very quick bounce back response, this pillow has a more traditional feel to it and was the one I preferred. Again, this pillow comes complete with a removable, washable protection cover. Redrock 5cm Mattress Topper was our other indulgence. Perfect for the home or caravan we chose this to try to enhance sleeping experience. We have bought cheaper mattress toppers in the past to be pleasantly surprised in the early days but find that they soon lose their ability to bounce back and support. Although more expensive than previous toppers, I wish we’d spent the extra in the first place. 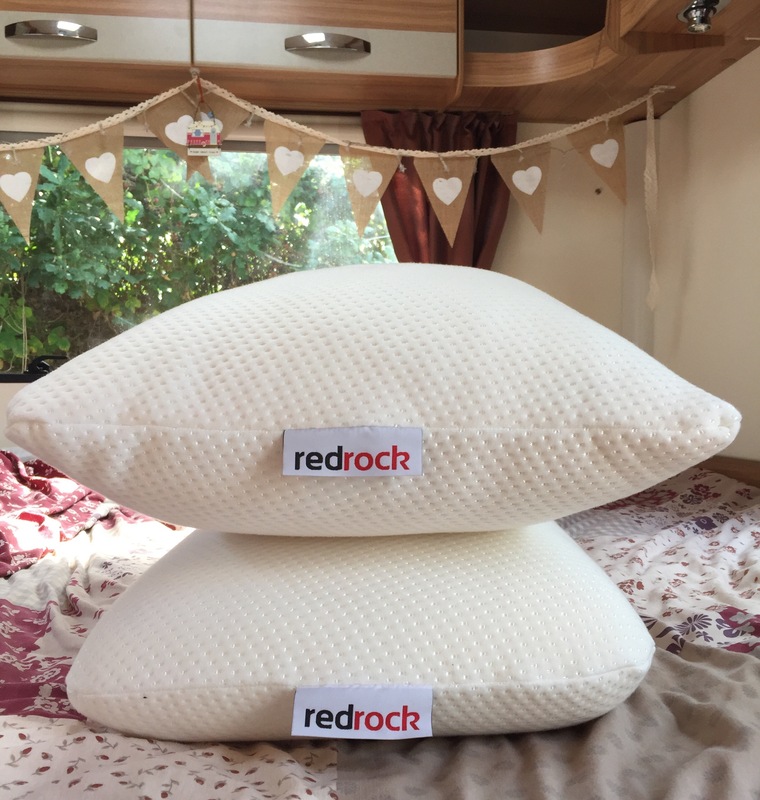 Made of high density lightweight visco memory foam this topper is an added benefit to upturned caravan cushions or even your mattress at home giving full body support. The topper is encased in a removable and washable, zipped, protection cover. We chose to use this topper at home, in fact our daughter placed it on top of her mattress. The mattress she has on her bed isn’t very old but was bought with the bed so possibly a budget one. She was starting to feel that she was no longer getting the support she needed and was having disturbed nights. Topper in place and she says it’s like having a brand new mattress.